"Seated Child" is part of my series of paintings about childhood. I had an idyllic childhood myself and realize that these days it's a rare commodity! 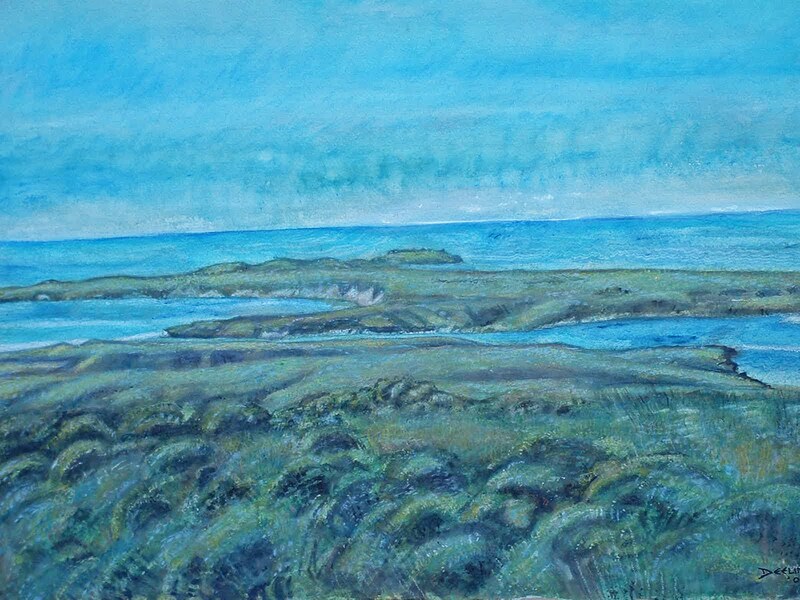 This was originally a large scale watercolor. Watercolor is a lovely medium, but the paper has to be protected, and the frames are expensive and cumbersome. 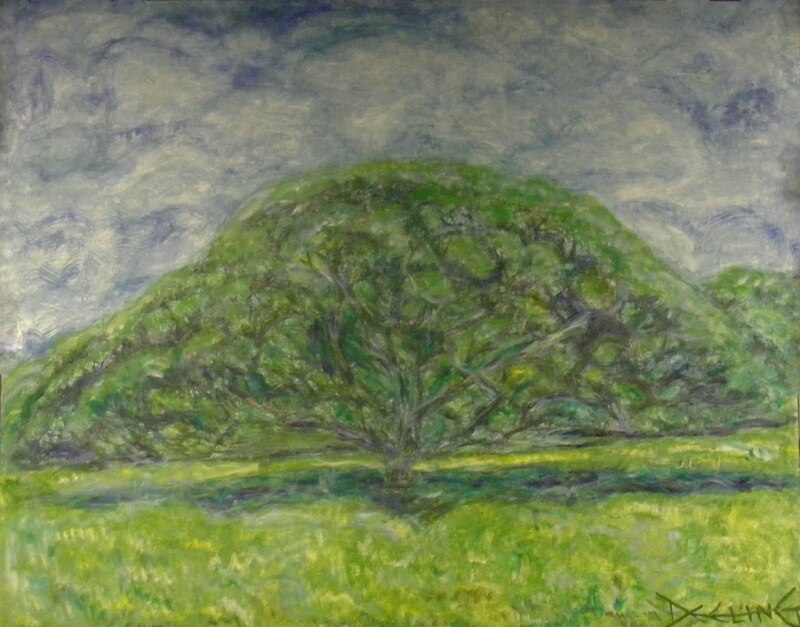 I did a large number of paintings on paper, which I had intended to do as oil paintings, but was prevented by a developed sensitivity to oil paints. 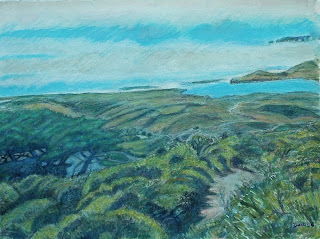 However, with the new technological advances, I once again can paint in oils! It is very exciting to me, much as I love watercolors. 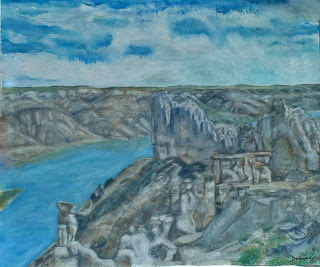 In fact, one of my ongoing projects is to paint oil on canvas versions of the watercolor paintings I had hoped to paint in oil. 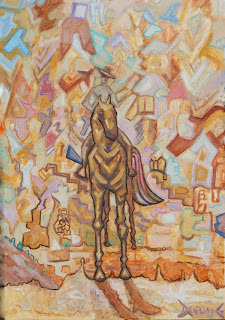 This painting is one of the first paintings I was able to do once again in oil. 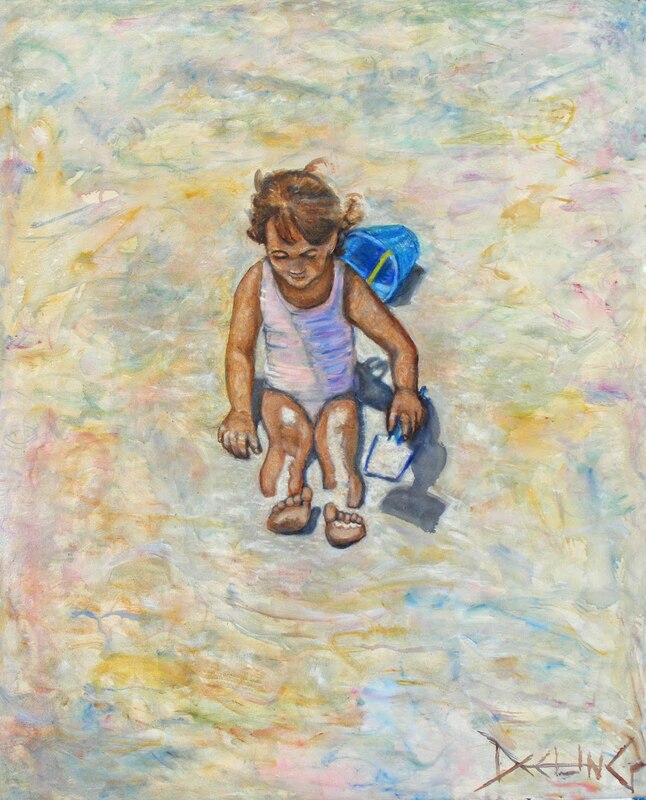 "Seated Child" is an oil painting on canvas, 50" x 38," painted in 2007 from my watercolor painting done earlier. This may be the final version of the painting! I modulated the solid blues, and the background figures are a bit more subtle. The colors are much more vivid in person than the tiny image conveys. Some viewers have expressed interest in the transitional phases of my painting. These phases can be instructional, entertaining, as well as instructional. Sometimes they serve as a precautionary tale against fiddling with a painting when it has reached a satisfactory conclusion. In addition, it is always wise to have on hand several blank prepared canvases, so that one can paint a thematic series, rather than painting many paintings on the same canvas. A few days ago Tiny reminded me that I am supposed to be taking snapshots of my works in progress. 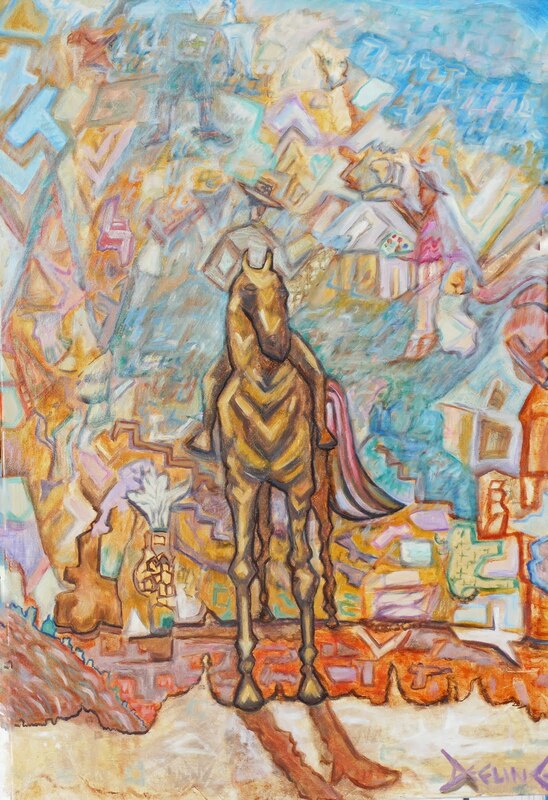 The various stages of paintings are often quite different from the finished result. In my case, I often edit out a lot of imagery that is rather amusing. Such is the case with this painting. It looks rather bland in comparison to the previous stage, which I failed to record. The painting is definitely in a transition phase. The whole thing needs refining, and the wacky architecture is a bit too wacky. More figures will be added, such as the one in the attic. In short, more fun will be had! So it's back to the drawing board! 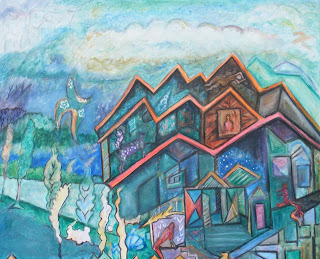 "The House That Chirp Built" is a 38" x 44" oil on canvas, started in 2010. 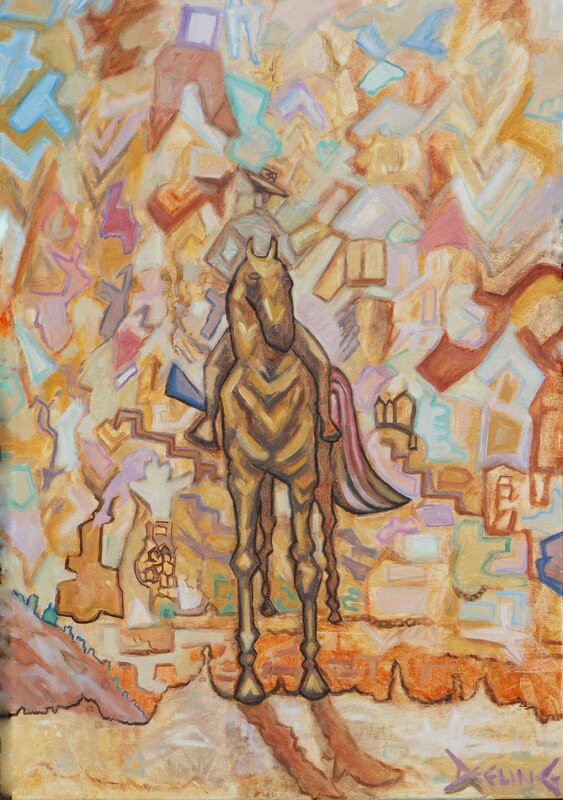 In 2009 I worked on a series of western themed paintings, some of which related to Tiny Montany's Ghost Town Sound Project. There are many picturesque ghost towns throughout the state. Many are closed to the public and under private ownership. Some of the downtown areas of Montana municipalities, like others across the country, are in danger of becoming ghost towns due to the downturn in the economy. 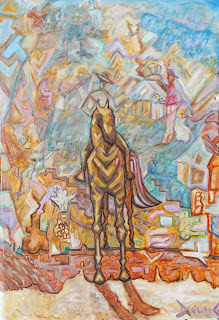 The rider series alludes to the horsemen riding out of the past, perhaps to the rescue of endangered communities. 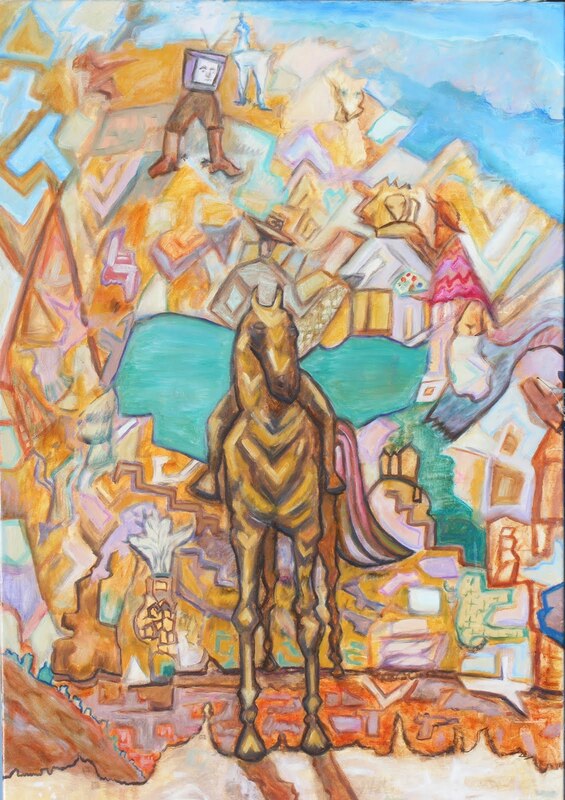 "Ocher Rider" is a work in progress, oil on canvas, 36" x 24" started in 2009. 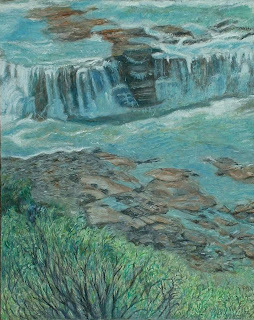 Depending on the time of the year, the flow of water allowed through the series of falls affords different elements of each of the falls to become evident. So it is with Rainbow Falls. A fortuitous excursion with Tiny Montany and Ginger offered a rare glimpse of the guardian of the falls, beyond the rainbow, the froth and the thunder. 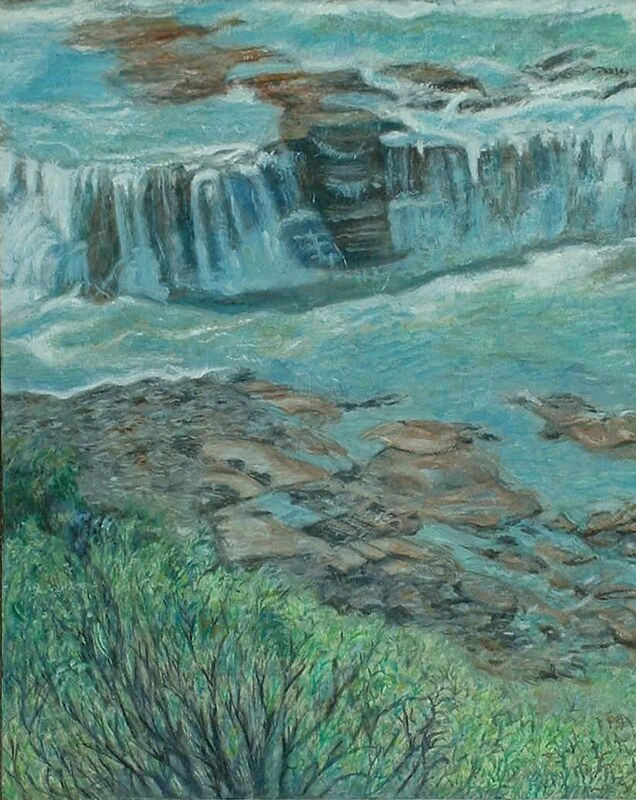 "Guardian of the Falls" is an oil on canvas, 48" x 36," painted in 2004. 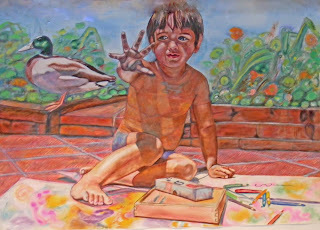 In the 80s I did a series of watercolors about creativity in childhood. The "First Stroke" series deals with the imagination of children, how they think and how they develop their imagination through drawing and painting--hand/eye coordination, story telling skills, etc. I found it visually interesting to incorporate images from the child's imagination in the paintings. 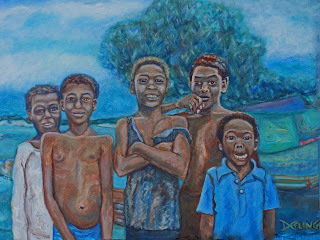 "First Stroke--One Hand" is a large scale watercolor on paper, 38" x 50," painted in 1985.
island life. It brings to my mind some of my favorite music of Jamaica by Scotty and Eric Donaldson. 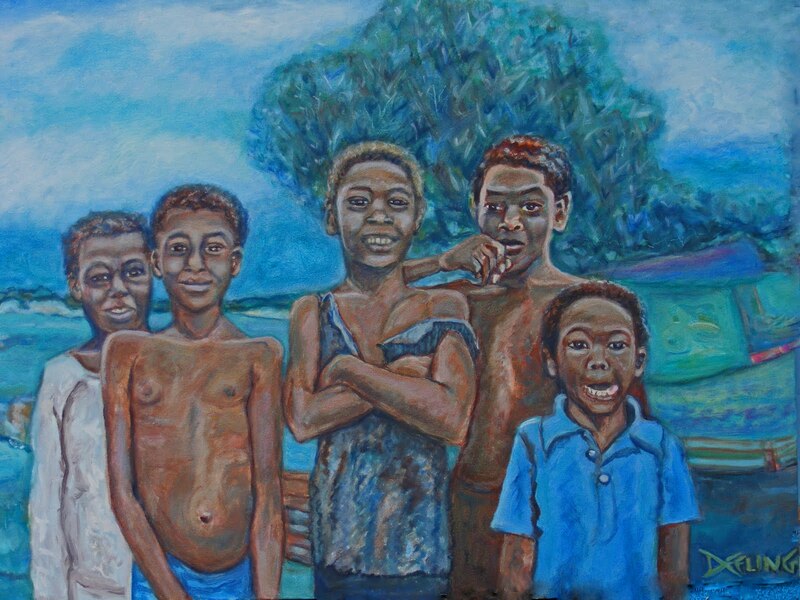 "Jamaican Children" is a 30" x 40" oil on canvas painted in 2010. The Vision Mountain fire which took place in 1995 in the month of October devastated over 12,000 acres. 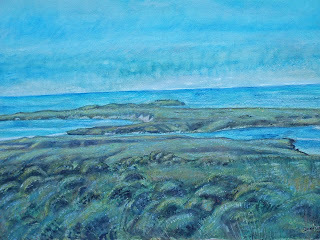 This series of watercolors was completed in 2003 from photographs I took in the 1980s. 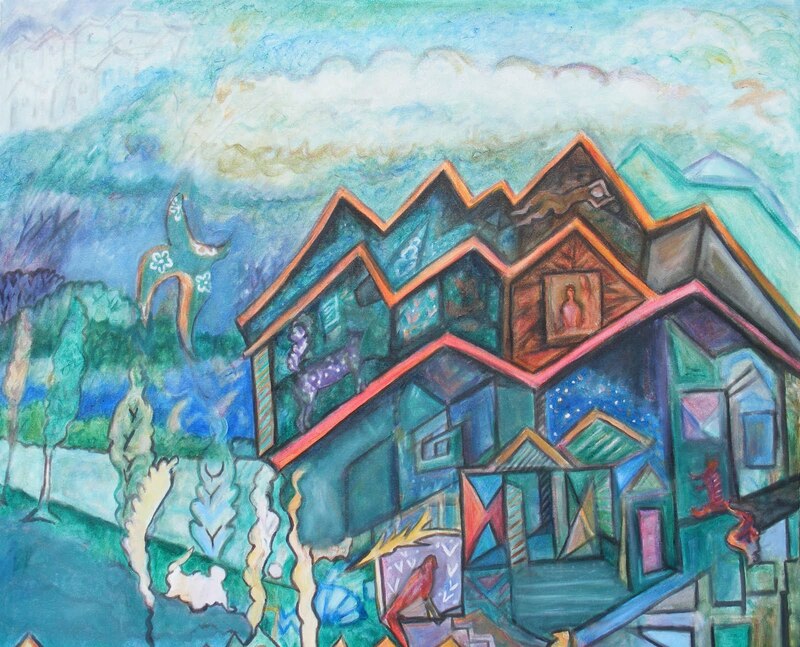 My original large scale watercolor, which I will show at a later date, was completed in 1989, before the fire. 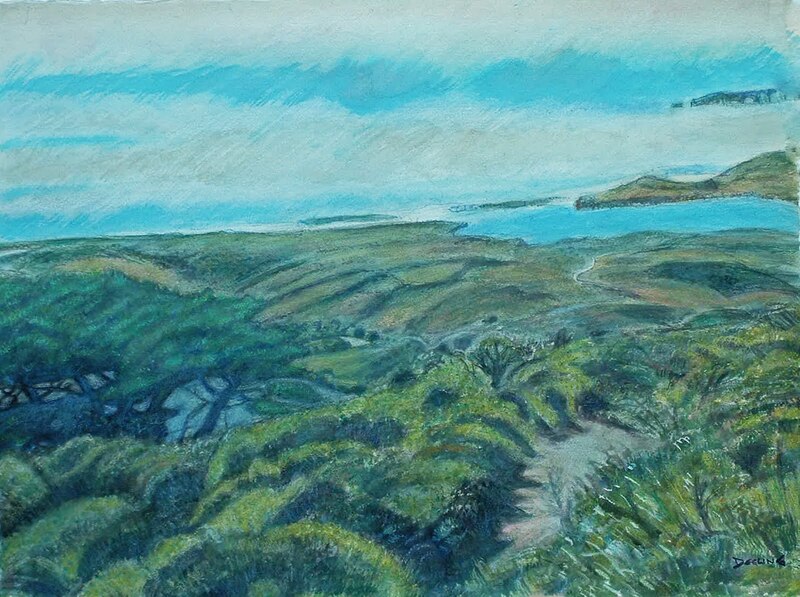 I am not sure which of the landscapes depicted in my paintings remained unscathed. They remain fresh in my memory, and I hope to revisit the area to determine the nature of the damage and to see how far along the rehabilitation process has progressed. I treasure the walks taken here with family and friends. "Vision Mountain 4" is a watercolor on paper, 24" x 30" painted in 2003. As you make your way east on the River's Edge Trail you first encounter Rainbow Falls, and after a short hike, bike or skate, Crooked or Horseshoe Falls. Once again you will be surprised by this small, yet picturesque landscape. Yucca, sage, grasses and other shrubbery meet the eye, but to me the biggest surprise of all might be the presence of cactus at this particular point in the trail. This same cactus hindered Lewis and Clark in their epic journey and should have kept them from portage around the series of falls, rather than making their way back into the Missouri between the falls. 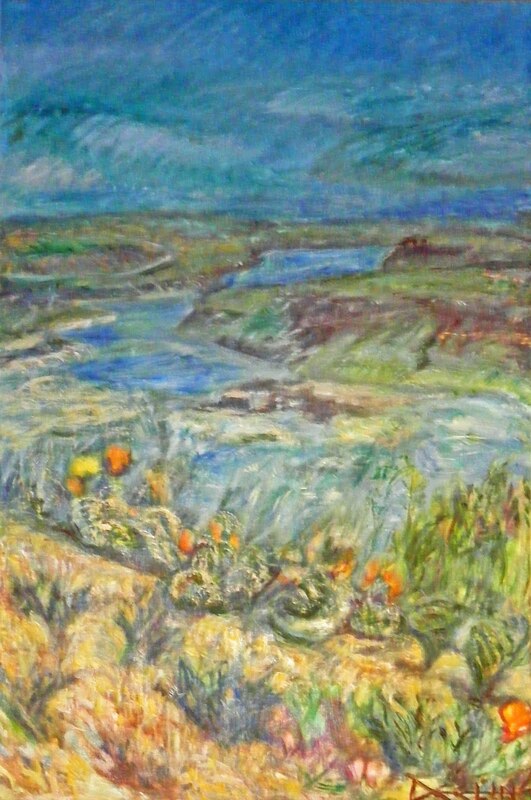 To the modern day recreational hiker, the cactus is a reminder that the high plains desert is a part of the river landscape. Cactus flowers in bright yellow and orange provide an extra visual treat. 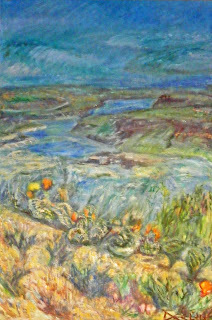 "Cacti," oil on canvas, 72" x 48," was painted in 2004. In my childhood I climbed many a tree--koas, banyan trees and even guava trees were among my favorites. Short trunks and low hanging limbs were attributes of great climbing trees. Guava trees, though small in stature, offered their own rewards. Never in my wildest dreams could I imagine a tree as magnificent as this monkey pod tree which grows in the Moanalua Gardens in Honolulu. Its canopy must be one hundred feet in diameter. I wonder if it would make a good climbing tree. If you are ever in the neighborhood of this tree, take an upward glance and perhaps I will be perched on one of the low hanging branches! "Monkey Pod Tree" is an oil on canvas, 48" x 60," painted in 2005. I lived in the San Francisco Bay Area for many years. It was quite a treat to stay in a beach house at Stinson Beach for periods of time. One particular stay was a month. When we were feeling particularly adventurous we might take a drive past nearby Bolinas, through Inverness, and even further still to a place called Vision Mountain. It looked like quite an ordinary destination at first, and one wouldn't have guessed the extraordinary sight at the end of the trail. Untold beauty, countless visions, visual jewels unfolded one upon the other. I've done a series of paintings inspired by the beauty of Vision Mountain, but none can match the beauty of Mother Nature. "Vision Mountain 2," watercolor on paper. 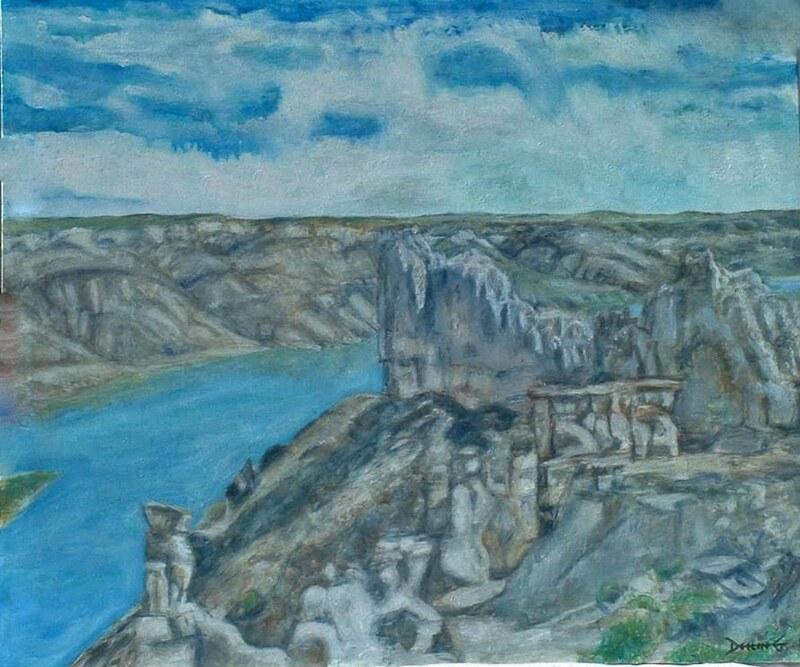 24" x 30," 2003.